Every page on your web site should have at least a couple of contextual links that point to other pages on your web site. These links should follow naturally from the content of your page. For example, if your page mentions PORTFOLIO, you can use those words to link to a page that is relevant to them. That's a contextual link. To make your web site even more search engine-friendly, consider putting the menu on the right, as with this web site. 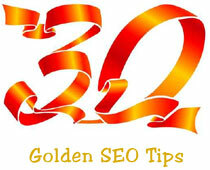 This will ensure that the first thing Google sees after the <head> section is your content. This is because search engines read pages from top to bottom and from left to right. Putting the menu on the right-hand side ensures that search engines will come to it after your main content. This is related to having a high signal-to-noise ratio. The contents tag should be identical or similar to the title tag - it has been found that Google loves this. In the dark ages of the pre-Google anarchy the keywords meta-tag was taken very seriously by the primordial search engines. Accordingly, the SERPs were dominated by spam web sites that stuffed their meta-tags with keywords. Nowadays the keyword tag is almost irrelevant. By all means include it, but make absolutely sure that no keyword appears in the tag more than once. Do not put more than 20 words in the meta-tag. The essence of SEO is putting high-quality content on a page, and making sure that search engines can fully read and understand the content. This means that the heart of SEO is quality text. Any text that is displayed as a JPEG file or other graphics cannot be read by the search engines. Look at the source code of a web page: that's what search engine can see. If you can't read it in the source code, search engines will not be able to read it either, and you will therefore get no search-engine credit for it. Spiders are programs that search engines use to analyse pages on the Internet; they go from page to page, following links and reading every page, making decisions on their quality and keeping a copy in order to show them on the search results pages for relevant queries. SEO is essentially about convincing these automated programs that a given page deserves to rank highly for a specific search query.